In honor of 90 years of tradition, Quill and Scroll in 2016 established the Blue and Gold Awards. 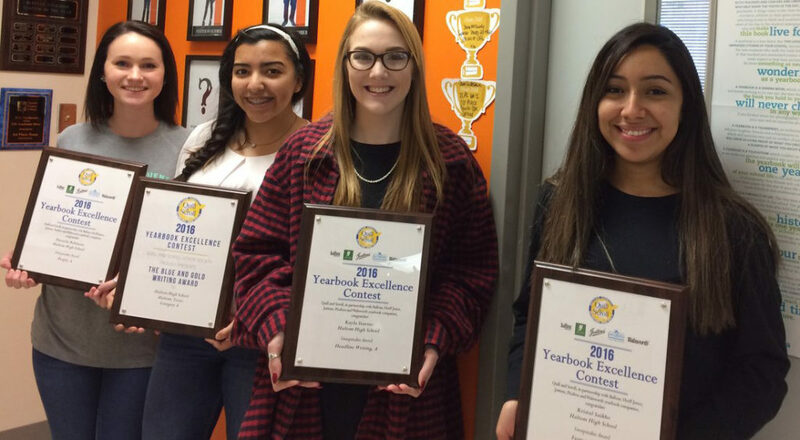 These awards honor high school journalism programs that excelled in the International Writing, Photo and Multimedia Contest or in the Yearbook Excellence Contest. As a participant in either of these contests, school’s media staffs are automatically given entry to this special contest. The Blue and Gold Awards are presented to top staffs based on individual student performance in the following categories: Comprehensive Writing, Comprehensive Visuals and Staff Excellence. Comprehensive Writing honors high school newsrooms for overall excellence in writing, including editorials and reporting. Comprehensive Visuals honors high school newsrooms for overall excellence in visuals, including graphic design, photography, and photo illustration. The Blue and Gold Award for Staff Excellence honors high school newsrooms for overall excellence in product. It is the highest Blue and Gold Award a staff can receive. Quill and Scroll International Honorary Society for High School Journalists recognized five scholastic media staffs with the inaugural Blue and Gold Awards launched in 2016 in conjunction with the organization’s 90th anniversary. These awards honor high school journalism programs that excelled in the Writing, Photo and Multimedia Contest. Quill and Scroll International Honorary Society for High School Journalists recognized 10 scholastic media staffs with the Blue and Gold Awards in the 2017 Yearbook Excellence Contest.